Since I’ve gave up doing regular Everyman polyphasic sleeping schedule, I’ve been setting my light alarm back to original wake times. While I expected the light and deep sleep cycles to slowly adjust back to having a long core sleep, I think their duration and cycle times have changed from my polyphasic sleeping. On “regular” days I’d go to bed around 9 pm and wake up some time after midnight, usually around 1 am. I’d do my strength workouts then and also some blogging. Around 3 am I’d go back to bed and wake up at 6:30-7 am. I’d also take a 20 to 30 minute nap right before noon. In total, I’m still getting close to the same amount of sleep as I was when on monophasic sleep. On certain days when I need to stay up late or wake up extra early, I can still function fine throughout the day with less than 5 hours of sleep. I think this is due to my one time adaptation to the Everyman schedule. But my sleep cycle hasn’t been great. I haven’t been waking up at the best time for my sleep cycle. Obviously we all have obligations and have to be at certain places at certain times. So it’s not like we can just choose to wake up at the most opportune time for us. Because of that, I started looking into something that can not only help me understand my personal sleep cycle better, but what I can do about it. There’s no shortage of sleep trackers on the market right now, along with fitness trackers like Fitbit that can do the same. But there’s one product I found that does this and more, on an exceptional level as well. Introducing the Sense by Hello, a sound machine, sleep and environment monitor, and smart alarm, all in one baseball size ball. This baby might not look like much, but it has done wonders for me in the bedroom (get your mind outta the gutter). I wake up fresh each and everyday, even when I have less than the ideal amount of sleep. 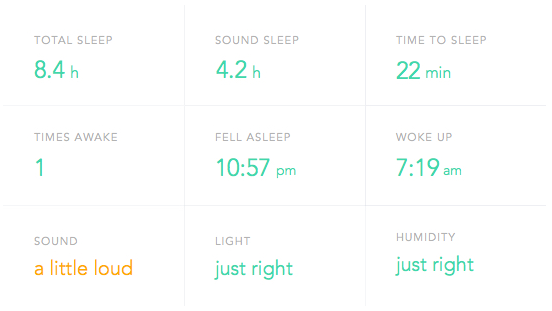 I personally don’t care too much for sleep data, but Sense has taught me more about my sleep environment than I thought I would’ve known. It’s given me information on what I can change to promote better sleep, what times of the night is best to go to bed and wake, my sleep pattern changes when I have to change schedule, etc. On top of all that, it plays ambient soothing sounds that helps us drift off. Whether it’s white noise to block out outside noises or fireplace, it definitely gets the job done. Let’s get into a few aspects of the Sense and Sleep Pill and how it can help you get much better sleep! This awesome sleep monitor includes the Sense, which is the cotton ball, and the Sleep Pill, which is the quarter size movement detector that we clip onto our pillows. There’s an accelerometer inside the Sleep Pill that acts as a sensor, detecting our movements throughout our sleep. These movements translates into sleep data that the Sense interprets and uhh… make sense of (see what I did there). The Sleep Pill is powered by a single 3V lithium ion battery, which can be found in any convenient store. They lasts up to 12 months and are easily replaceable. Most of all, the Sleep Pill communicates transfer all its data to the Sense via bluetooth. So there’re no wires, no tangling, no mess we have to worry about when we sleep. This little ball is our key to an awesome night’s sleep, each and every night. Each of these parameters are recorded by the Sense throughout the night. In turn, we get a report on how each of these affects our sleep. Maybe as the night gets cooler, we tend to sleep deeper and get more restful sleep. The Sense can tell us that. Or maybe we’re heavy sleepers and even when a car alarm went off in the middle of the night, our sleep seemed to be unaffected. The Sense will let us know. The combination of these factors can provide us with valuable data on how we sleep, and what’s best for us. Of course, the Sense comes equipped with an audio speaker that plays soothing sounds to help us drift off. The same speaker plays up to 15 different tunes to help us wake up slowly and peacefully during the ideal lightest sleep cycle. In addition to the bluetooth communication with the Sleep Pill, the Sense has WIFI capability so we can check our data online. It comes with a USB power adapter and a micro USB cable. No worries about batteries with the Sense, it’s as simple as plugging it into the outlet. All the data collected by the Sense and Sleep Pill gets uploaded to your account online, which you can access on you iOS or Android device. Juts to give you guys an idea of what you can expect data-wise, here’s are a few examples of reports you can find for your own personal online account. 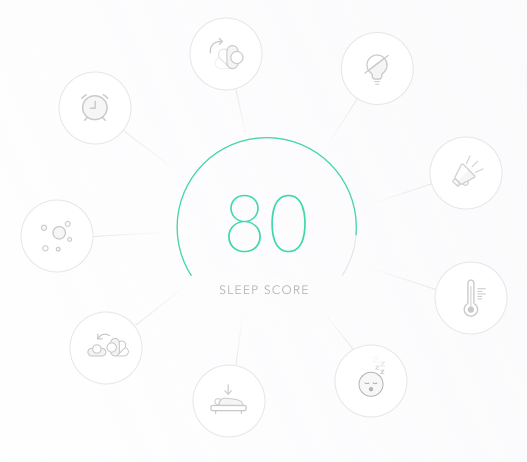 Our sleep parameters are displayed in a easy to read and understand format. This information are used to compared to the environmental factors mentioned before. When a trend has formed of our regular sleeping habits, the reports will make recommendations based on the changes it detects, as show below. For those that like a challenge or something to follow by, the reports has a sleep scoring system that shows how well we slept. As you can see, all the different factors are taken into account. Environmental factors such as light, noise, temperature, etc. in addition to sleep factors like how much we moved, total sleep time, etc. all used to to generate an overall score. So try to score as high as you can! The Big Question- Does It Really Work? With everything that we purchase, this is probably the first and last question we always ask. I’ve given my brief experience about this at the beginning of this post. But don’t just take my word for it. Here are some testimonials from a few others that have tried it. 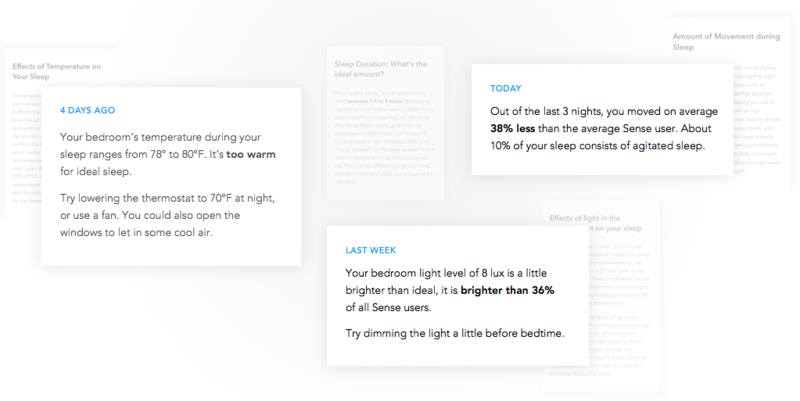 “I was on the fence about getting a sense to help track my sleep due to the myriad of less than positive reviews. However, I noticed a lot of them were from a while back and that more recent ones stated the company’s improvements, so I decided to give it a try. First of all, the design is beautiful. The hardware and app both look great and the app is really easy to navigate. The pill is inobtrusive and stays clipped to the pillowcase, something I was skeptical about. However, for the first few nights I had problems with the tracking. My dog frequently wakes me up to take him out in the middle of the night, and whenever I’d get up to walk him, sense would stop tracking for the night. That’s almost a nightly thing, so if the problem couldn’t be fixed it was going to be a deal breaker. – Online review from Keifer Slaton with a verified purchase. Here’s another review on how the Sense and Sleep Pill has been improving the sleep quality of someone with self-proclaimed serious sleep issues. Their doctor was impressed as well. “As someone with serious sleep issues, this crazy little device has given me and my doctor a whole new insight into my nightly sleep patterns. One of the features that were an immediate plus, was the Smart Alarm feature. I no longer wake up in a bad mood after being woken by some horrible siren, and then stay in that bad mood all morning. The Smart Alarm wakes me when I’m in a light state of sleep with a soothing musical alarm, and I wake up actually in a good mood. The only drawback right now is travel. I’ve taken two weekend trips since purchasing it, and I was unable to get it connected to the hotel internet, so I have no sleep info recorded for 6 days last month. – Online review from C. Ruggles with a verified purchase. No one can answer that question except for you after you’ve tried it out yourself. It just may be the best investment you’ll make for your sleep. After all, who doesn’t want restful, good quality sleep?